BERLIN - The weather outside might have been cold, but Berlin’s hot start to Wednesday’s game proved to be the difference against Maloney. The Redcoats scored three first-inning runs and got 5.1 innings from starter Gianni Fanelli to beat the Spartans 5-4. Fanelli also ended his afternoon with six strikeouts and earned his first win of the season, while Daniel Valdesi drove in two runs to provide his pitcher with some runs. 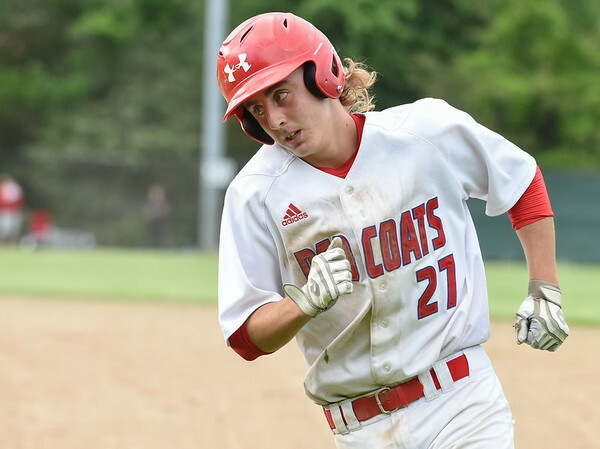 Maloney scored two runs in the top of the fifth to cut Berlin’s lead to one, but the Redcoats were able to hold on for their second win of the season. Rocky Hill 3, Newington 2: The Indians and the Terriers played almost identically of each other, but Newington’s committed four errors to Rocky Hill’s three. Joey Zawisa received the loss in the Indians’ season opener. Jack Kelley drove in both of Newington’s runs. He went 2-for-3 at the plate. South Windsor 6, Newington 1: Dave Magsayo was the lone Indian to record a win on the afternoon. Newington’s No. 4 single player beat Neal Shah in straight sets 6-4, 6-4. Southington 7, Plainville 0: The Blue Knights got the clean sweep, while the Blue Devils showed there is still a little work to do as the season gets underway. Abby Murphy, Coral Tommervik, Molly Murphy and Jill Watson all earned singles wins for Southington, while the pairings of Carolyn Callahan/Chantelle Gimenez, Gianna Wadowski/Madison Beaudoin and Emma Wojcicki/Kate Hardy picked up doubles wins for the Blue Knights. East Catholic 4, Newington 3: It was a tough way to start the season for the Indians, but they got plenty of strong play out of their doubles teams. The pairings of Ellie Wronka and Melissa Riggins; Samantha Miller and Kelly Iskra; and Lindsay Weaver and Julia Mazur all earned wins for Newington. And while the singles all battled tough according to Indians head coach Sean Hussey each fell. Posted in New Britain Herald, Berlin, Newington, Plainville, Southington on Thursday, 5 April 2018 21:15. Updated: Thursday, 5 April 2018 21:17.